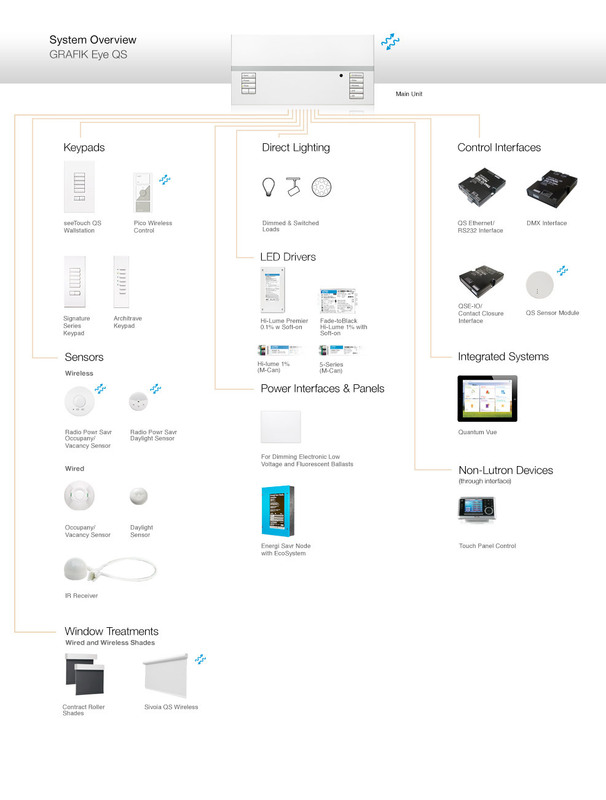 The diagram above provides an overview of the components that constitute the GRAFIK Eye QS system, as well as compatible Lutron products. You can refer to the categorized list below to find a complete list of components with more detail about select products. With a GRAFIK Eye QS main unit behind the scenes, you can count on dependable light control. Lutron power interfaces allow you to control a variety of light sources including fluorescent, electronic low voltage or large switching loads. GRAFIK Eye QS works with several other Lutron systems for added flexibility, features and capabilities. *GRAFIK Eye QS features may vary based on system selected. Control the GRAFIK Eye QS system at the touch of a button with programmable, easy-to-use keypads. Lutron occupancy sensors automatically turn lights on when a room is occupied and turn them off when a room is vacant. The GRAFIK Eye QS system uses the following interfaces for integration to other systems.